Tour of America » Where’s George? September 13, 2008 at 5:21 pm · Filed under Where's George? Back in mid-August, following a $1500 round of repairs at Airstream, a faithful blog critic who goes by the alias of “Dr. C” suggested that we “pass the digital hat” for donations. This was intended to help us with the financial cost of traveling around and tantalizing you with blog entries about all the fun we are having. Dr. C’s comment was well-intended but I was pretty sure we wouldn’t be inundated with money, so I responded by saying that we already get a lot of non-financial support from blog readers, and that was good enough. I further said that if anyone felt blog readers could do more, they should write their suggestions on the back of a $20 bill and mail it to me. Well, somebody actually did that, and so I got the $20 bill pictured at left when we picked up our mail in Kanab yesterday. The letter came anonymously, with a postmark of Troutdale (Oregon? Virginia?) over a “Princess Aurora” postage stamp. At least, I think it was Troutdale — the cancellation was not clear. Despite my severe disappointment that the sender ran out of fifties, I appreciate the thought and want to put the bill to good use. I have registered it at Where’s George.com, a website that — believe it or not — tracks the progress of US currency as it is spent. The system depends on people voluntarily going to the website and entering information about the bill, when they get it. To alert people to the trivial importance of doing so, along the top edge of the back of the bill I have written “Please track me! at wheresgeorge.com”. Let’s see if anyone actually does. You can follow the progress of the bill by following this link. If there are updates posted online, I’ll get an email too, and I’ll mention it on the blog. 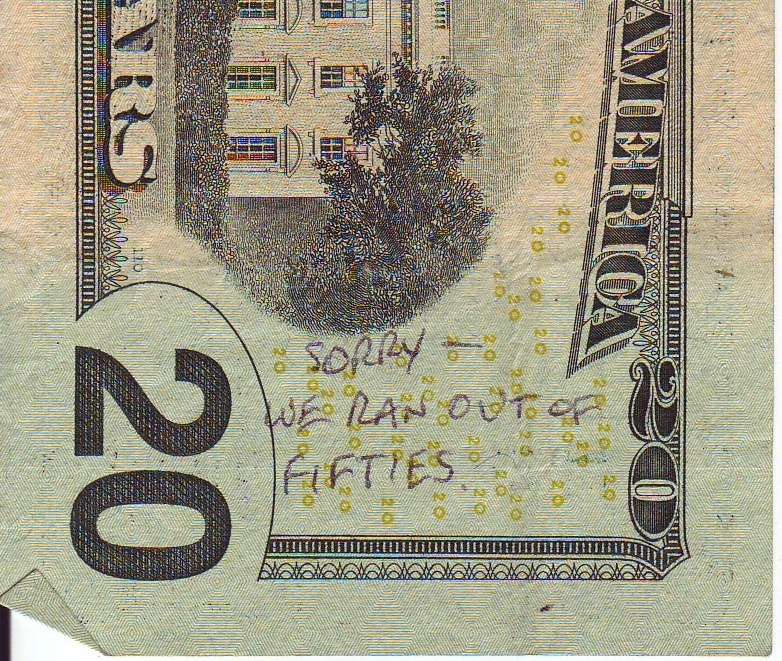 Of course, to get the bill started in circulation, I need to spend it. It’s my responsibility and I intend to rise to the occasion soon. I think we may try one of Kanab’s little restaurants on Sunday. Hopefully the bill will begin its own Tour of America soon and not end up stuffed into a mattress somewhere, and we’ll be able to see where this thoughtful donation goes from here.